Okapi’s artificial intelligence (AI)-based technology is used to optimize operations in Toronto’s Commerce Court, Southcore Financial Centre and other buildings, and it recently helped QuadReal Property Group win a Pinnacle Award for Innovation from BOMA Toronto. 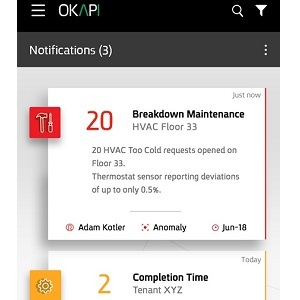 Okapi’s platform interprets and delivers real-time notifications to operational teams, allowing them to provide proactive and focused service to tenants. It uses AI algorithms to find anomalies in data and root causes for performance issues and then delivers them as personalized notifications to different team members in the field. It predicts performance based on history and alerts teams to possible problems that might evolve, allowing them to take preventive actions. “Our secret formula is based on combining data from IT (information technology) and IoT (Internet of things) sensors within organizations in order to gain most of the value out of it and to provide the many teams operating in all the different fields with personalized notifications,” said Okapi co-founder and chief executive officer Iris Tsidon. Okapi, named after an African mammal which has the features of a giraffe, deer and zebra and needs to sleep only five minutes in a 24-hour period yet still remain alert, was co-founded five years ago by Tsidon and chief revenue officer Maya Gal. The company developed the AI platform two years ago. Tsidon was previously vice-president of business intelligence at Ness Technologies, chief operating officer at Gilon Business Insight and served as human resources VP at several large industrial companies. Gal was previously project and consulting division manager at Ness Technologies, co-founder and chief technology officer at e-learning platform Hi-Teach, research and development manager at Microsoft and knowledge management leader at Amdocs. Okapi’s platform is well-suited for property management groups, supporting operations teams to improve tenant satisfaction, preventive maintenance, and capital planning. Vancouver-based QuadReal was established by the British Columbia Investment Management Corporation, one of Canada’s largest institutional investors, and has a $24.5-billion investment portfolio that spans 17 countries. The company is always in search of new technologies to help it innovate the way it builds, how its buildings function and to improve tenant experiences and satisfaction. Alina Lloyd, QuadReal’s vice-president of digital innovation, expressed interest in testing Okapi’s platform because it was dealing with multiple systems with data coming from too many sources and wanted smarter data distribution for its teams. Quadreal also hoped to improve efficiency through better resource management. Ninety days after implementing Okapi, QuadReal reported an 87 per cent reduction in completion times, an 82 per cent reduction in response times, and another 13 per cent improvement in repeating requests. Okapi’s platform enabled QuadReal’s operations team to increase tenant satisfaction quicker and more efficiently, and allowed managers to make better decisions in real time. QuadReal plans to implement the Okapi platform in other property classes and roll out additional modules in preventive maintenance and capital project management. Okapi’s Canadian clients include QuadReal and Discovery Air, and its platform is used in several office buildings. Other clients include AHAVA, Fire & Flavor, Kanfit, Bynet Semech Outsourcing Ltd., Comprehensive Orthopaedic Global, Novo International, MX1, OmniSYS and Moss Adams. Tsidon said Okapi is finalizing deals with other American and Canadian companies. Okapi’s head office is in Palo Alto, Calif. The company also has an office in Toronto that includes Gal, a sales vice-president and four other people, as well as in Hod HaSharon, Israel.